The air that comes out the air conditioning vents has mildew odor. The reason for this problem is that the drain pan is not draining. We received a lot of email query about a 1998 blazer hot air blowing air conditioning system, so instead of answering the email one by one we decided to discuss the problem. The principle that is applied to the automotive air conditioning system is that when liquid turns into a vapor it will absorb heat so that the surrounding area cools down. It is similar to the principle that when a body is wet and the perspiration is exposed to the wind the body will feel cool. 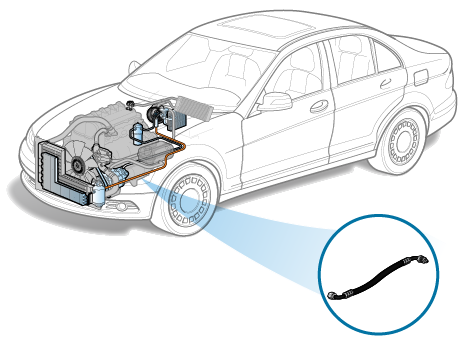 The illustration is shows basic structure of the air conditioning system of an automobile. The cycle is that the refrigerant changes state from liquid state to vapor state and back to the liquid state again. The liquid becomes gas when the refrigerant absorbed heat and the surrounding becomes cool, then the gas is compressed making the refrigerant temperature to rise, now as the gas cools down it will return to liquid state. When the car air conditioning is turned on, the air that comes out the air con vents is with mildew odor. Car ac is blowing hot air suddenly or is blowing hot air slowly overtime. Cold air is usually coming out the ac vent when the ac switch is turned ON, however after turning the ac switch ON, the ac vents is blowing hot air.